Clearly, no better way to celebrate 200 years of freedom, liberty, and justice for all than with red and blue corduroy bedspreads for the kiddos. Don’t worry that the dog will shed or the PB&J sandwich will spill, these are bargain priced at about $11 each. If the flag colors aren’t your “thing,” then try those ubiquitous 1970s colors, Harvest Gold and Avocado Green. If you click to zoom in, you’ll find out those not the real names for these colors, but we know ’em when we see ’em. 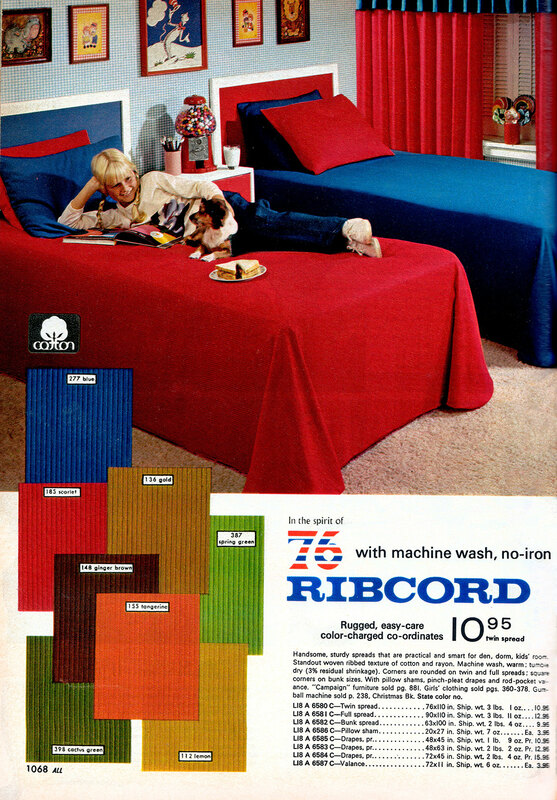 In fact it’s not Corduroy either, but “Ribcord” – a far cooler name for a product that conveys the Spirit of ’76.